On Saturday we hit DuPont and did the "hardest" trails there plus lots of fun stuff like the swoop downhill Airport Loop and some nice easy trails. It had a little bit of everything and what a difference riding on a full suspension bike than an old hardtail with v-brakes! I also installed my dropper seat post prior to this trip and took advantage of it here. The dropper post really does work to give you the extra confidence and maneuverability needed to go downhill fast over drops and rocks plus trying new stuff. The best part of the weekend: I did not fall or crash once. We did 20 miles in DuPont and then on Sunday, we did about 13 miles in Pisgah going over Clawhammer (5-6 miles uphill) and then down Black Mountain. There was some serious hike-a-bike to get to Black Mtn but it was still fun. This was my first time out in Pisgah and I want to go back now. I regret not making an effort to go on these trails before this year but I feel ready now and up for the challenge. By the time Monday rolled around, I was too tired to do anything and took a break from biking/working out. But I knew I was going to get my birthday WOD in on Tuesday so I showed up for the 6AM class and lucky for me, Karen did the WOD with me. 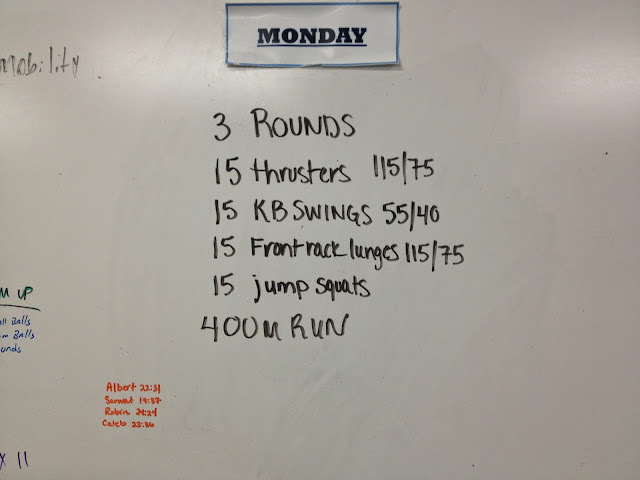 This was much tougher than I even expected, and I created the WOD! My strength and endurance has taken a hit and I wasn't able to do the WOD even at 65 lbs much less 75 lbs! I did the first round and then got through the second round of power cleans and had to drop the weight to 57 lbs. It was still tough but I loved every minute of it. It was a great way to start of my "new" year.